ABT is known as a tuner with a unique touch. 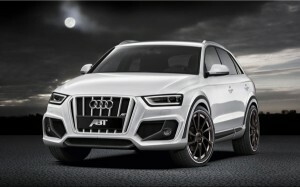 And it shows with their latest project, the new Audi Q3 crossover. You can’t say it’s pretty, but it’s certainly impressive. The redesigned front bumper and grille, flared arches, and new rear skirts, they are all designed to make an ultimate city crossover. In connection with the striking ABT front grill and the front spoiler the inherently compact car seems more powerful and to have more presence. The rear wing, rear apron and exhaust pipe covers ensure that from the rear of the SUV you can see that the car has a good figure. The German tuner also has an extensive plan for the engines. the most powerful version of the 2.0 TSI is expected to offer 250 HP or 184 kW (series standard: 211 HP/155 kW). The 170 HP version (125 kW) has been converted by ABT Sportsline into a sports engine with 210 HP (154 kW). For SUVs, a diesel engine is of course always a good, economical solution. As a result ABT POWER is also available for both performance levels of the economic 2.0 TDI: the series standard 140 HP (103 kW) is increased to 170 HP (125 kW), while the version with 177 HP (130 kW) as standard offers a high-torque 195 HP (143 kW) after the power treatment by ABT. ABT also offers extravagant light metal alloys from the CR and DR ranges to complete the look of this unique urban cruiser.